I have been off work for the last week due to ME, a chronic illness I have that stops me from doing regular activities more often than I would like. When I get a few minutes respite from the symptoms, playing around with NWN and writing this blog are one of the few things I can do that help me to relax by removing me from the stresses that make my illness worse. And while I may not even be as active with this as much as I would like, at least I can still contribute something. I have been continuing to look at the resting system that the campaign will use, and I hope to be able to make another post about that when I have finished ironing out some of the last items and scripts that it will use. In the meanwhile, I made a couple of discoveries regarding companions and their development when it comes to some of the properties set on them. Where Have All My Spell Slots Gone? 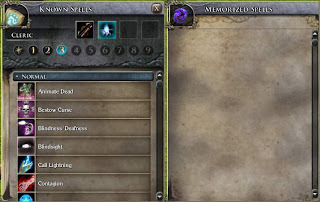 The first thing I learned was that if you add spell using classes to a companion in the toolset and then try to use them in game, then their empty spell slots would be missing and there would be no way to learn spells with them. 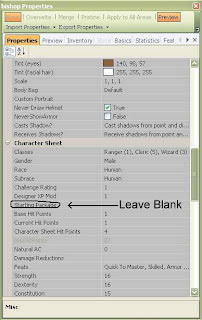 (Interestingly, I can see this being quite useful as a way of developing characters in a way that excluded them from spell learning in a world where such may not be possible ... but that's another story.) The solution turned out to be to use the Set To Package Defaults button under the "Spells" properties tab for the PC, which would then allocate all the spells for you. NB: If you add the spells manually (a few at a time), you are able to alter the amount of spells that the PC has access to from the start, but they will still be unable to learn more, even if their level would imply otherwise. Of course, in normal game play, this would not be an issue, as the player would have allocated spells as they progressed in levels within the game. I simply mention it here as it confused me for a while. There was one other handy tip that I learned from Nasherzor on the forums, and that was how to enable any PC to speak with another NPC. By default, the Main PC will switch back to being played if a player speaks to an NPC. However, there may be circumstances when a player may wish a specific PC they are controlling to speak with the NPC in question. To enable this, I have learned that the Can Talk To Non Player Owned Creatures button on the NPC being spoken to needs to be set to TRUE. I'm yet to leraning how to make custom packages so my NPCs can only level up at pre-determined classes (like if I have a dwarf warrior, maybe he could to only multiclass to Dwarven Defender, and so on).